So, you're sitting at your computer in February, looking at snow falling outside your window, and dreaming of warmer days. You've come to the right place, because we have just the thing. 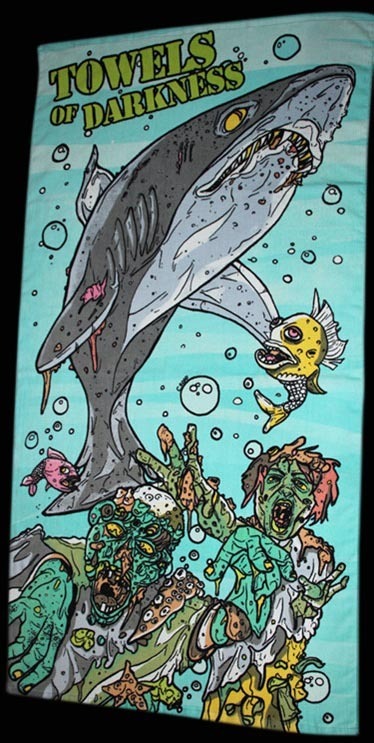 Get ready for spring in style with this awesome "Infected Waters" beach towel by Towels of Darkness. 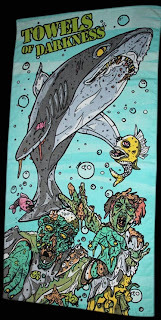 Designed by artist Cristy Road, this towel is 30" x 60" with a soft velvet top and absorbent terry beneath which should do the trick after a nice, long shower; or, you can save it for a day of fun in the sun. Over the next week or so, we're taking entries for your chance to win. Like always, just hit us with your name and mailing address to darkness@zombiesandtoys.com, and we'll draw a winner soon. Tell your friends, and check out ToD on Facebook at Towels of Darkness.